Bipolar Disorder And Anxiety: Which Comes First And What If You Have Both? Anxiety and bi-polar disorder commonly co-exist. Anxiety tends to exacerbate bipolar disorder, so early and accurate diagnosis is paramount. Anxiety has a significant impact on bipolar disorder treatment that assessing for anxiety is becoming standard. Research indicates that more than 50 percent of people with bipolar disorder also have an anxiety disorder. Anxiety and bipolar share common symptoms but if anxiety symptoms persist in the absence of depression and mania/hypomania, this is suggestive of an anxiety disorder. Co-occurring anxiety tends to exacerbate bipolar disorder, so early and accurate diagnosis is paramount. Anxiety has a significant impact on bipolar disorder treatment so assessing for anxiety is becoming part of standard care. Mania or hypo-manic (less severe) episodes. These are periods where you feel exhilarated, energetic, overly optimistic and self-confident; this is an extreme feeling of well-being that can lead the person to become detached from reality. Hypo-mania is the less severe form that can progress to mania. Depressive (feeling low in mood) episodes which are often severe and long-lasting. Psychotic symptoms are possible during manic or depressed episodes. 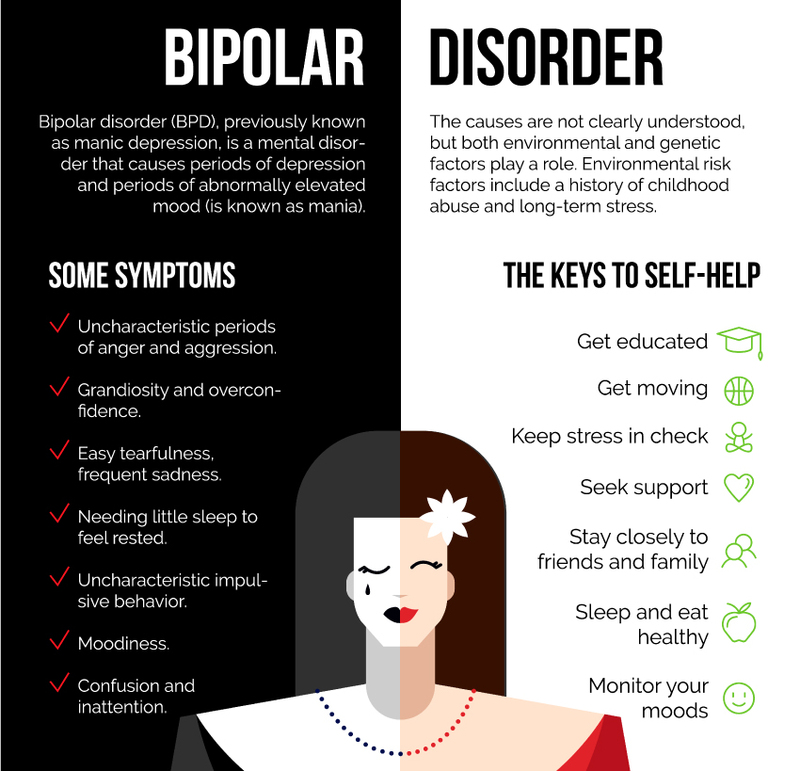 Bipolar is a mood disorder that has two key states of depression or mania and many people find they experience one more than the other – i.e. they will generally be depressed but may have, at one stage, have experienced a manic episode; some people also experience mixed episodes where they are manic and depressed concurrently (otherwise known as dysphoric mania. Often anxiety will be a component of any one of these episodes which some people refer to as bipolar anxiety, which refers to anxiety that is with depression or a part of dysphoric mania. However, many people who have bipolar disorder also have a co-existing anxiety disorder such as generalized anxiety disorder (GAD), panic disorder, social phobia or PTSD, for example. Anxiety disorders, either in their own right or when combined with a mood disorder are unfortunately associated with an increased suicidal risk; and insomnia associated with anxiety can also trigger manic episodes. The prevalence of co-morbid bipolar and anxiety disorders is high: studies consistently report anything from 40-93 percent of anxiety disorder prevalence in bipolar disorder, depending on lifetime and current rates. This wide range can be illustrated by one specific study which found that amongst 1,600 patients with bipolar disorder, 60 percent had experienced symptoms of at least one anxiety disorder at some point, and 40 percent had suffered from two or more anxiety disorders. Another large-scale longitudinal study found that the combination of ADHD and anxiety specifically increased the risk of bipolar disorder 30-fold compared with those with no prior ADHD or anxiety at all. A co-morbid anxiety disorder in those with bipolar patients can considerably complicate its presentation, how symptoms are interpreted, its treatment and its long-term prognosis. Co-morbid mental illness is unfortunately associated with greater risk of psychosis, earlier age of onset, less effective treatment response and greater resistance to treatment, impaired quality of life, suicidal ideation and actions, and substance misuse. Often the anxiety disorder predates the diagnosis of bipolar and could, therefore, be regarded as a risk factor. An overlap between anxiety and bipolar symptoms exists, but generally, where anxiety symptoms persist outside of times of depression and mania/hypo-mania, this indicates an anxiety disorder. Further risk factors include familial links (although it is unclear if this is genetics or environment) - co-morbid anxiety syndromes are common in families with bipolar disorder. Unfortunately, co-existing anxiety tends to worsen the trajectory of bipolar disorder —meaning more depression, mania or hypo-manic episodes. However, it is not clear whether people with both conditions have more severe bipolar symptoms due to the anxiety itself or because the co-existing disorders should be seen as a specific (and more severe) form of bipolar disorder in its own right. Part of the challenge for diagnosis and treatment is that anxiety and bipolar disorder interact in various ways which differ from individual to individual. The use of antidepressants specifically for anxiety in bipolar patients can be problematic as traditional medications can often worsen bipolar symptoms such as triggering manic episodes, for example. This accounts for the observation that psychosocial services are generally used more frequently by patients with co-existing anxiety. Atypical antipsychotics have shown some benefit in anxiety reduction in social anxiety disorder and GAD and significantly reduced anxiety symptoms in patients with bipolar disorder. However, cognitive behavioral therapy (CBT) has been shown to be as effective as medication in the management of panic disorder; and, unlike medication, the effect has been shown to persist long after treatment has ceased. One study looking at treatment found that participants with co-morbid anxiety disorders scored more severely on several measures than those without anxiety. However, despite more severe illness characteristics, this did not appear to be an impediment to making progress in a psychosocial treatment program; indeed although the treatments were focused more on the bipolar disorder than the anxiety disorder, the participants made significant improvements in anxiety symptoms regardless. Recent research indicates that treating both disorders together yields the best results. A recent study trialing a specific psychological intervention to address anxiety in the context of bipolar disorder was conducted and found to be more successful than traditional treatment approaches alone. Anxiety has such an influence on how a person with bipolar disorder responds to treatment that assessing anxiety is increasingly becoming incorporated into bipolar disorder care. This is significant as historically, depressive or manic symptoms would be the primary focus for managing the condition, with anxiety not receiving the appropriate attention. Understanding their condition can encourage people to learn the role their anxiety has to play in their bipolar disorder and incorporate it into any relapse prevention plan. Learning to distinguish between “bipolar anxiety” and stress from a specific source can further empower the person to manage both more successfully. has anyone found an increase in manic behaviors with gabapentin? can you become addicted to the prescription drug haldol (haloperidol)?